15oz proofed walls and roof Australian Made. Please refer to your car manufacturers recommended towing capacity. Our soft floor camper trailers all have an off-road coupling which we will fit the vehicle adapter when you pick up. Jayco camper trailers and caravans all have a standard 50mm ball coupling. 5 mins for basic set-up, 10mins for annex set-up. We also provide training on pick-up or prior to pick-up. For the Jayco camper annex set up there is a Youtube video which guides you through the set up. Do the campers have power? Yes the off-road soft floor camper trailer all have a deep cycle battery and Anderson plug on the draw bar for recharging, with some campers having a 240 volt battery charger mounted in them which requires a 240 volt power source or generator. The Jayco Swan and Expanda all have 240 volt power when available or can be operated by the 12 volt deep cycle battery. We hire a folding 160 Watt solar panel kit for $30 per week which includes all the plugs. What happens if the camper is wet when it is time to pack up? Our campers have water proof canvas which will not allow rain to penetrate through, however we do supply an extra tarpaulin to cover mattress for when the camper is folded up to keep bedding dry. The camper must then be set-up within 24 hours to dry, and avoid propagation of mould and mildew. Does the camper trailer have storage areas? Yes, the camper has storage under the bed area, 1200mm W x 2100mm L x 430mm H minus the space of the tailgate kitchen. There is also a large lockable storage box on the draw bar. Does the camper trailer have a spare tyre? Our campers have 1 spare tyre mounted vertically on the draw bar. 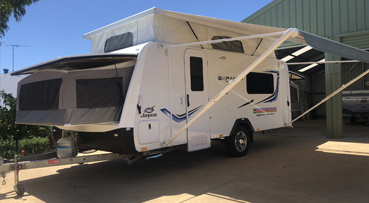 Jayco campers have a spare mounted on the back wall and the Jayco Expanda has the spare mounted underneath. All trailers have a 6 stud Landcruiser stud pattern. Is the camper trailer insured? 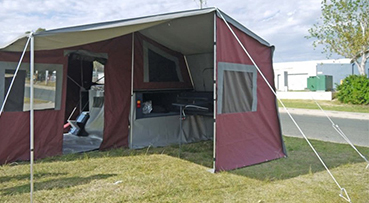 All Gobush Camper Trailer Hire campers are fully insured for travel anywhere in Australia. Jayco caravans and camper trailer are restricted to bitumen roads only no off road travel allowed. There is a $1000 excess in the event of an insurance claim. Any minor damage that does not exceed the $500 bond deposit already paid will be deducted from the bond and not warrant an insurance claim. What is available for water storage? Soft floor camper trailers have 3 x jerry can holders of which we supply 1x 20L water jerry can. A 70L under body water tank is fitted to the Adventurer model and a 110L tank is fitted to the Explorer model. All Jayco models have a 80L under body water tank with a provision to run mains pressure water when available. There is innerspring queen size mattress in the off-road soft floor camper trailers and floor area for extra bedding. 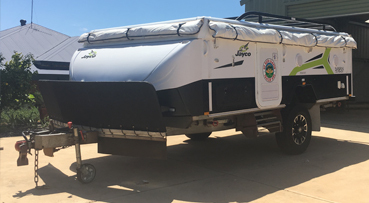 Jayco camper trailers have a double and queen size innerspring mattress plus a drop down single bed made up from the table. The Jayco Expanda has 2 double innerspring mattresses and a set of bunk beds. Yes all our trailers have electric brakes, we supply a mobile electric brake controller free of charge with the hire of the camper trailer. We can supply the trailer plug adapters also if required. Soft floor campers have a 7 pin small round plug and the Jayco campers and caravans have a 12 pin flat. Are there any restrictions as to where I can go? Off road soft floor campers may travel on any recognized road or track. Jayco campers and caravans may only travel on bitumen roads only, no off-road travel allowed. Does the camper have a fridge? No fridge is provided in our soft floor camper trailers, however you may hire our 40lt or 60lt Waeco fridge/freezers. The Jayco Camper has a 90L 3 way fridge (gas,12/240volt) and the Jayco Expanda has 150L 3 way fridge/ freezer.